Cost is $300, not covered by insurance. When you consider the comprehensive testing, data, and specific, individual training information, I think this is beyond cheap. I think of it as an investment in my training, like buying the right shoes and paying my coach. 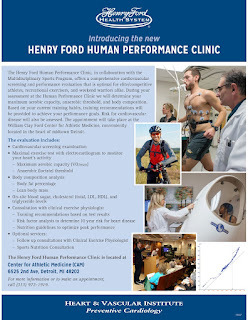 On June 29, I'm going to the Henry Ford Health System Human Performance Clinic and I'm definitely super geeked. As I go through the experience, I'll document everything and share it through social media and my website. If any of my athlete-friends are interested in going through this testing, I'll be happy to share the details of the experience with you. I'm the kind of person who researches EVERYTHING before she engages. First up is the Body Pod (http://www.fox2detroit.com/health/93318737-story), the thing I'm probably most scared of. I'm pretty comfortable with the way I look. I hardly ever get on the scale. I figure if I train as hard as I do, continue to improve as a runner, and fit in my clothes, I'm probably okay. I do NOT want to know the number on the scale. It won't be right, no matter what it is. 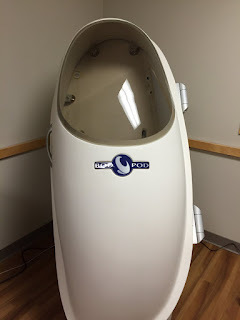 The Bod Pod, however, measures fat, bone, and muscle, and I have full confidence that the staff at Henry Ford will explain it in a way that makes it feel scientific and athletic and not all judgey. Eric said, "Well, both are similar and different at the same time I guess. Yes, you will be on treadmill and I have my own running protocol I use for the test. For the equipment and mouthpiece part, it looks just like it does on me in the flyer I sent you [top of page]. 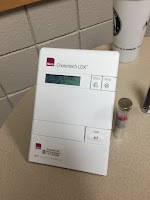 You will have an EKG hooked up to you to monitor your heart as well as the mouthpiece to monitor the air/gas exchange. Neither one of those videos had an EKG in them so they are not the same. Those were strictly VO2 tests, whereas we are performing a cardiopulmonary exercise test or cardiopulmonary stress test." I called my husband right after the Human Performance Clinic testing and he could literally hear the excitement in my voice over the phone. My coach, Amanda, and I were seriously geeking out over the experience and the data. I was so glad she came with me, because I never could have processed the experience and all the information on my own. Plus, she's going to write about this from a coach's perspective. And she documented the experience! The staff and doctors treated us like professionals and didn't dumb anything down. Eric (Exercise Physiologist & Preventative Cardiology) explained all the data in a way that was so specific to my training and racing and medical history. We had so much fun and I feel like this was one of those experiences that pressed the RESET button on my training and running. New data, new ideas, new perspectives. Below is a description of the experience in the order we went through the testing. Basic medical history & cardiovascular screening The usual paperwork at the doctor's office, but more specific to an athlete. If you don't usually know your numbers, bring them with you. 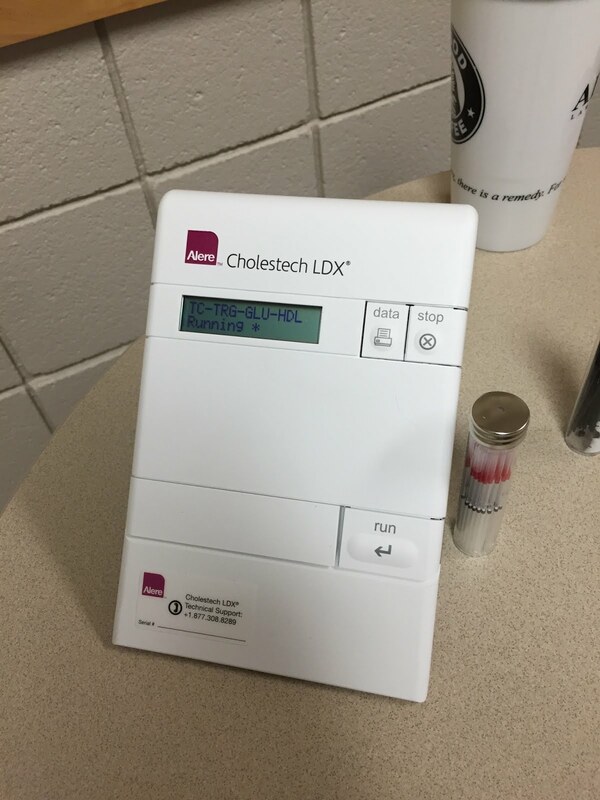 Blood sugar, cholesterol (total, LDL, HDL), triglyceride levels & resting blood pressure Finger prick instead of blood draw means we got this data right away! Didn't hurt at all. Fasting blood glucose was a little low. Definitely good to bring something to eat before running. Body composition analysis The Bod Pod! You can read more about the Bod Pod here. Basically, it's very similar to underwater weighing. I wore a sports bra and compression shorts, took off all jewelry, and put on a swim cap. Allison, Eric's intern, weighed me on the Bod Pod scale. Then I got inside the egg from Mork and Mindy! It's close quarters, but not too scary. Two, 45 second tests to get the volume of the chamber with me inside. Allison opened the door to check on me in between readings. I felt a very minor pressure change (I'm really sensitive to pressure changes). You can hear some clicking sounds and what sounds like a heartbeat. Fast and easy! Results are amazing! You learn what percent of your body is fat and what percent is fat free (muscle, water, bone, and organs). WAY more informative than just calculating your BMI online. 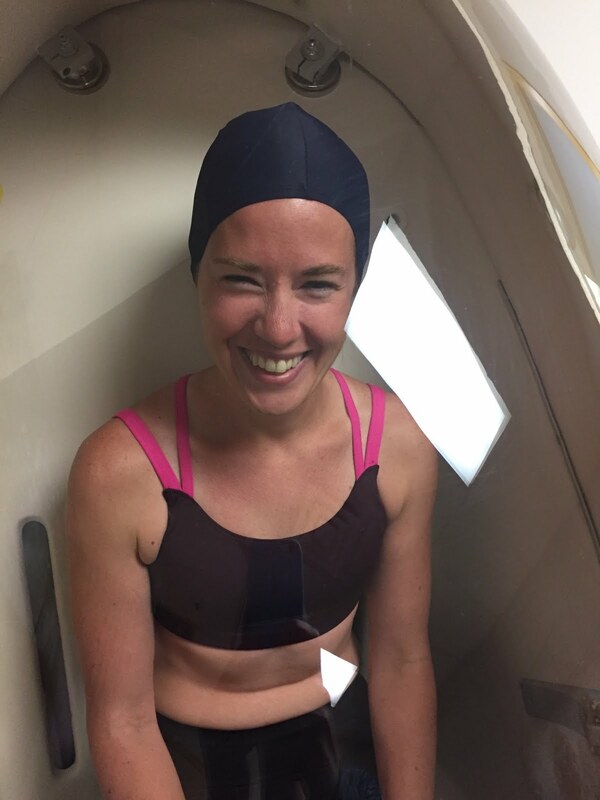 The cool part is that you also learn your resting metabolic rate (RMR), "The minimum energy your body needs to support its basic physiological functions...the amount of energy that the body uses at rest." The data also calculates a daily total energy expenditure (TEE) based on RMR and daily activity level. So, since I'm "Active" and my RMR is 1119, I burn about 1947 calories on training days. I'm excited to know my RMR and TEE because I have a tendency not to eat enough to support both my RMR AND my running and strength training. Eric said you can pay $40 just to have your body composition done in the Bod Pod, separately from the entire Performance Clinic program. It could be cool to come back and get it done the month before my next goal race, the Detroit Free Press Marathon, on Oct. 16. VO2max, anaerobic threshold, and EKG The treadmill portion. First, more paperwork to make sure I understood that this was a test meant to push me to my physical limits. Also, don't take a shower afterwards. According to Eric, the intensity of the test dilates your blood vessels and the addition of a hot shower would open them up more, possibly leading to fainting. It's two days later and I'm still waiting for him to call and let me know if it's okay to shower. (Joking) Lots of blood pressure readings throughout this portion of the experience. Then Allison got me ready for the EKG leads. Cleaned my skin with alcohol wipes, but also had to prep it with sandpaper. I mention this because I went for a (sweaty) run after the clinic and the sweat did NOT feel good on those parts of my skin! 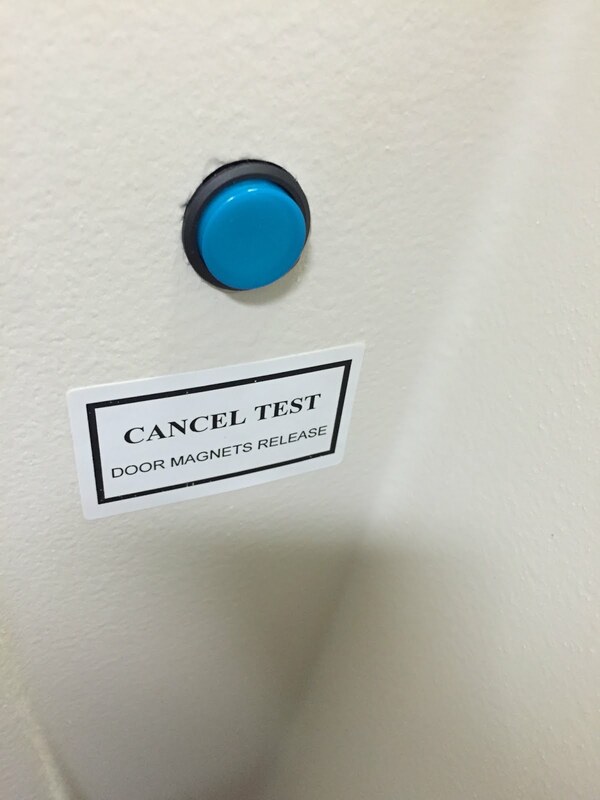 Maybe, if you go through the testing, don't do that. Anyway, all the wires and the black belt you see around my waist in the pictures are the EKG leads. If you're not comfortable running in just a sports bra (girls) or shirtless (boys), you can run in a shirt. Next, I met with Dr. Nayak. I think she typically just goes over your health background to make sure you're ready for the treadmill testing, but she also spoke with me about my anemia, so this took a little longer. She and Dr. Keteyian are helping me find a new primary care physician (PCP) who understands athletes who train at the level I train. This is another part of the experience for which I'm grateful. A doctor's office with a comprehensive approach. This wasn't just about putting me through the testing and sending me out with a snapshot of data. Because I expressed I was unhappy with my current PCP, this was also about setting me up for future health and success as a runner within a network of doctors who work together to address issues. Most runners know how hard it is to find ONE good doctor, let alone an entire network, who understand what we do. I now feel like I have people I can call when I need help! Que Dr. Keteyian, Eric, and Allison. Time to run! 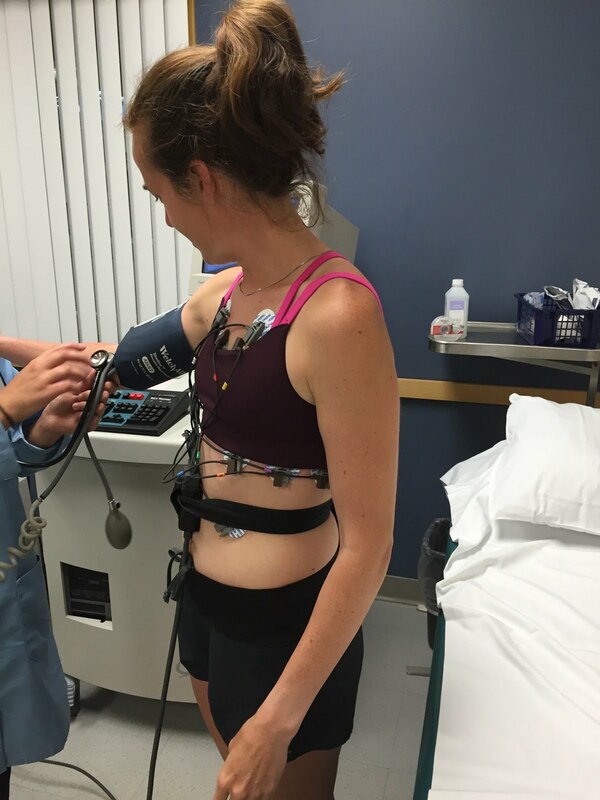 First thing everyone wants to know is whether it's hard to run while hooked up to all that "stuff." I didn't have a second thought about the EKG leads and wires, even when I was running at my fastest pace. The tube in my mouth in the pictures is like a snorkel or SCUBA mouthpiece. It measures O2 in and CO2 out. It honestly didn't bother me at all. The only thing that was a little weird was having my nose clamped shut. They have to do this so all gases go through the tube. It was a little weird for me because I'm a nose breather and I was a little stuffy. You can't spit or exhale out your nose! But it honestly didn't really bother me once I got going. Eric started the treadmill at a comfortable, warm up pace. Then he started increasing the pace every 2 minutes. Towards the end, he increased it every minute. Finally, when I reached my fastest pace, he started increasing the incline, but that didn't last for long. 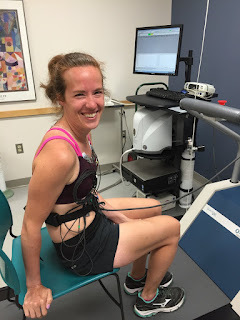 The whole time, the machines were measuring my heart rate and determining my VO2max. Allison took my blood pressure once in the beginning while I was running a little slower. 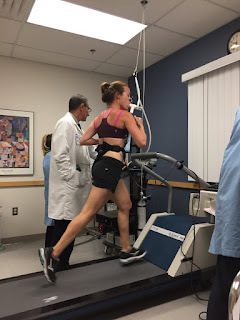 Luckily, Dr. Keteyian determined that I'd reached my VO2max right around the time I was ready to tell them I couldn't keep going. I think I ran for around 10 minutes. To the right is a picture to give you a sense of what the paces were like. These are based on my 10k race pace of 7:10. And that was the end of the testing! Sit down, water, towel, take off EKG leads. 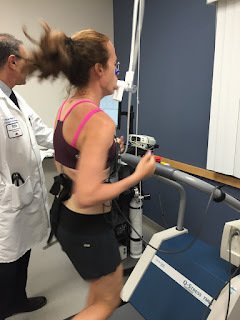 Then Dr. Keteyian discussed VO2max and lactate threshold with Amanda and me. He asked us how "science-y" we wanted him to get. Since we both geek out over this stuff, we told him to go for it. Some of it was a little over my head, but I knew Eric was going to explain it and relate it to my data, so I didn't stress. Consultation ALL the data! I can't praise Eric enough. He could have given me my summary and sent me on my way to read and interpret it on my own. No way. We must have spent half an hour going through my data, relating it to me and my training. Body composition is healthy (Bod Pod). We also discussed the other Bod Pod and blood work data I mentioned above. All was fine. I have .1% rise or a heart-related problem or stroke, according to the American Heart Association. So there's room for improvement! Nope. Eric said everyone is statistically at SOME risk; they don't give out 0% risk assessments. Damn. Basic stress test results in the picture to the right. I'll receive more data through Henry Ford's McChart, but everything was fine. I did learn what Peak Heart Rate means, though. Apparently it indicates the level to which you can push yourself to keep going. I kind of always thought it was a bad thing. Like, my heart rate shouldn't get that high while I'm running. Eric said 196 is good. 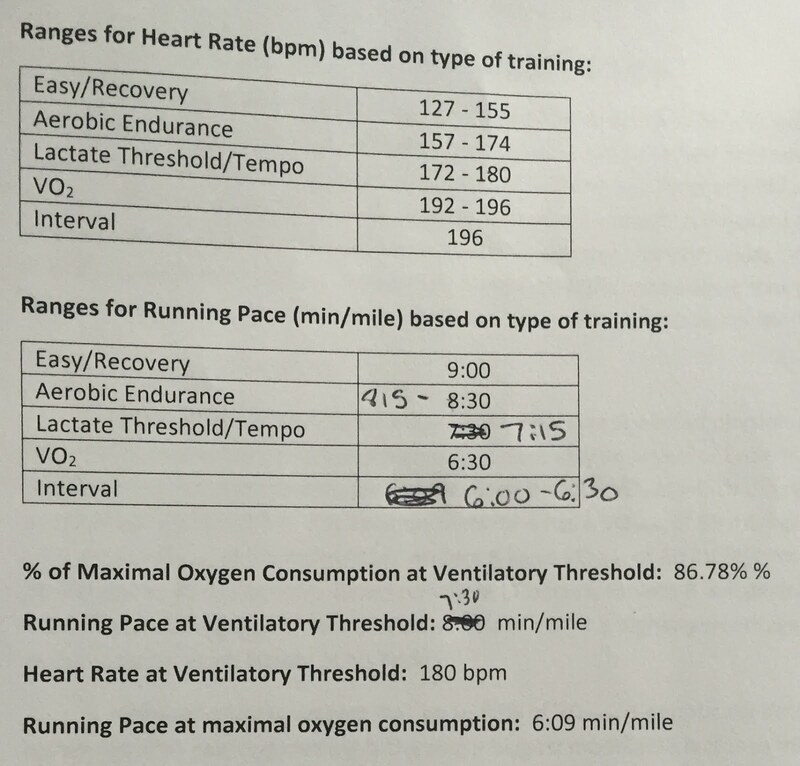 My "% of Maximal Oxygen Consumption at Ventilatory Threshold (VT)" is 86.78%. "Maximal Oxygen Consumption" is my VO2max. VT is basically the same as Lactate Threshold (LT). "The VO2 at which LT is achieved may be a better predictor of performance" than just VO2max. So, 86.78% is a good thing because "(s)he can run at a higher percentage of (her) VO2max and not accumulate as much lactate in (her) body." 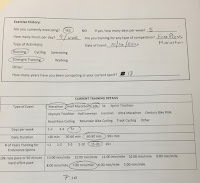 So now Coach Amanda and I geek out with Eric over new training data. Picture to the right. This is based on SCIENCE, peeps! Not just my most recent race paces. 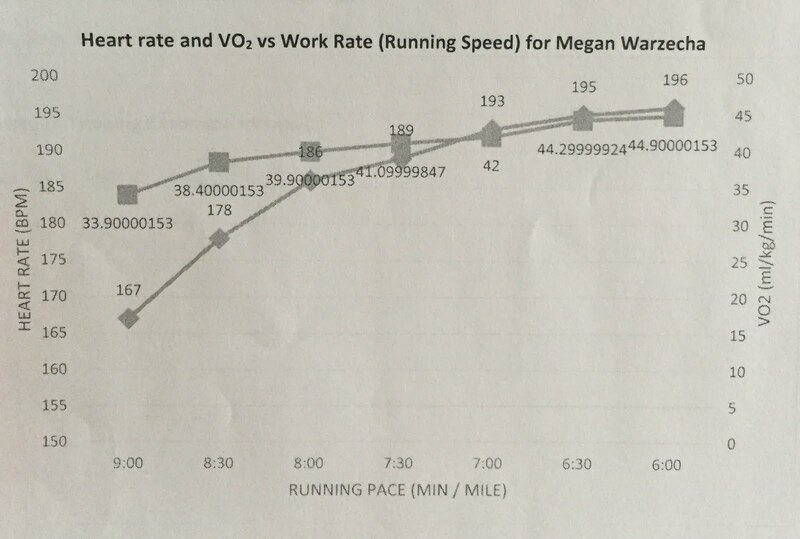 So, to interpret, the charts on the right suggest training heart rate (HR) and pace ranges. Aerobic Endurance refers to long runs. Lactate Threshold/Tempo refers to the HR or pace I should run at for 40-60 minutes straight to improve my lactate threshold. I can improve the rate at which I clear lactate at higher intensities. Interval refers to track workouts. We did a little tinkering with paces based on some information I shared with Eric. 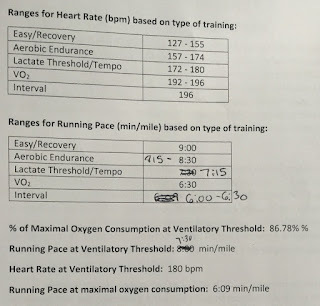 The summary Eric sent home with me included a more in-depth explanation of VO2max and lactate threshold and how to use the information in training. Summary Would I do this again? Absolutely! I hope to do it again about a month before the Detroit Free Press Marathon to see if my fat percentage has decreased and to see if my lactate threshold has increased. The experience was eye opening and exciting. Eric and Doctors Keteyian and Nayak not only gathered the data, they went above and beyond to explain everything. That was so key! I can't believe we have something so comprehensive and in-depth right in downtown Detroit. People don't realize Detroit is a major city for endurance sports. We have the Free Press Marathon. We have more road and trail races and triathlons than you can count. We have training and races teams and running groups. 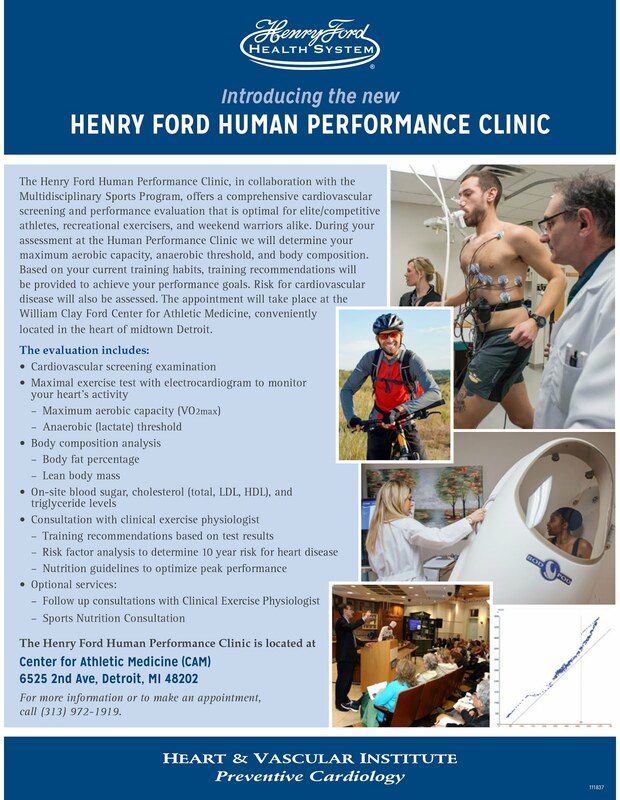 And now we have the Henry Ford's Human Performance Clinic and the experience is beyond worth your time and money. 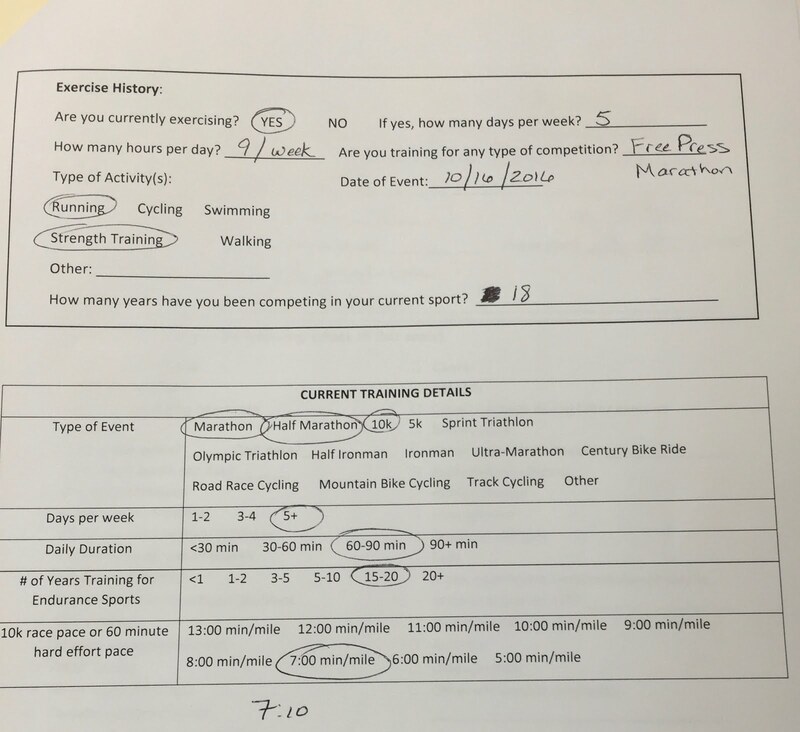 I can't wait to report on how the information I learned effects my training and racing! Thanks for the detailed write up. 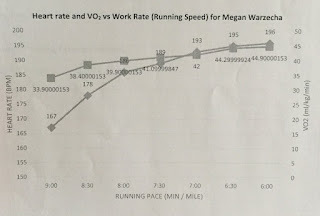 I was looking for information on the VO2 max test and came across this entry. 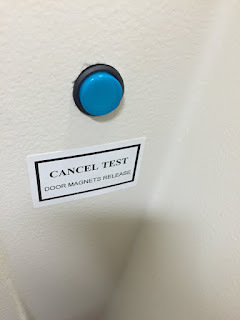 I've been through the testing twice and it's a great experience. If you have any questions, I'm happy to talk. My test is tomorrow morning at 11:30 EEK. FUN! Good luck!!! Report back and let me know how it goes! You're in for a treat. Eric and Dr. Keteyian really know their stuff. And it's fun to push yourself to the limit. And oh my LORD don't go for a run until you've given your skin time to heal from the sandpaper the use to get you ready for the leads. Learned that the hard way! Your blog post was so spot on, it was as if I had already been there when I arrived this morning! I'm a slow starter so I jogged 1.5 miles to loosen my muscles before heading up. It's a smooth operation from start to finish, Eric is awesome. I did a cool down jog of 2 miles afterwards but with the cold temps outside, I never broke a sweat so it wasn't bad at all. That's so awesome. I'm glad you had such a great experience! It's so fun. Like you said, data to last a lifetime. It's fun to go back and do it a second time! I ended up going back a few weeks after my goal fall race, the Freep 26.2. I'm curious to know how you're planning to apply your data. Paces or HR? Are you training for something right now? Just wanted to get a baseline? I would rather gouge my eyeballs out than start training with HR, but it makes a ton of sense! I'll most likely stick to pace training for now, with an eye on effort versus absolute pace. I'm pretty good using that method. My goal is to try to qualify for NYC. That requires a 1:28 half marathon. The Rock CF half marathon, Martian 5k, Clawson Firecracker Mile, and Romeo 2 Richmond are some of the events on my race calendar this year.